Zak's Sidewalk: The future is now! We are in the future. 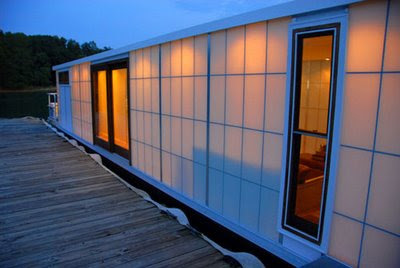 This morning, Stephanie Reiley of Unm00red, twittered a link to this amazing houseboat with, get this, translucent aluminum panels. Does anyone else remember Star Trek IV? The Voyage Home? No? Good, then I'll recap. A mysterious craft comes to future Earth looking for humpback whales. Of course only the intrepid crew of the Enterprise can figure this out, but unfortunately in future Earth there are no humpback whales, so Kirk must take the whole crew back in time to find some and bring them to the future to stop the mystery craft from vaporizing the Earth's oceans looking for whales. As you can imagine with bringing anyone, especially a half-Vulcan from the 24th to the 20th century, hilarity ensues. I'm getting to the point: In order to transport the whales back to future earth, the crew must construct a holding tank within the cargo bay of their commandeered Klingon vessel. Since the Klingon ship wasn't outfitted to transport humpback whales (probably because they didn't exist during conception and construction) Bones and Scotty are dispatched to obtain the materials and oversee construction. What they need for the tank are walls of transparent aluminum. Now, this technology is so advanced that, despite the dire need to transport these whales for the survival of future Earth, Bones is concerned with the time-continuum impact of hastily introducing this technology to a manufacturer of convenience. Scotty dismisses Bones' concern, "How do we know he didn't invent the thing." Oh Scotty. But there it is! Transparent aluminum, a technology brought to us by spacemen from the future. And now it's on houseboats.